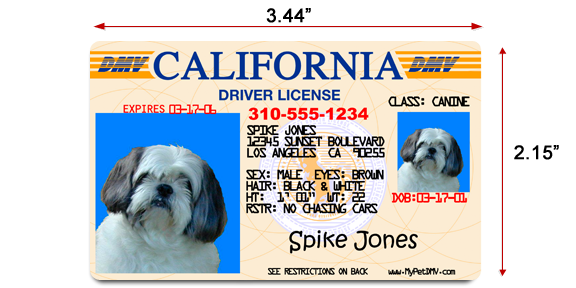 ach Pet ID License comes with (1) large wallet sized Pet ID Card that looks similar to an actual Driver’s License and (3) smaller versions for $19.95. FREE SHIPPING on ALL ORDERS. 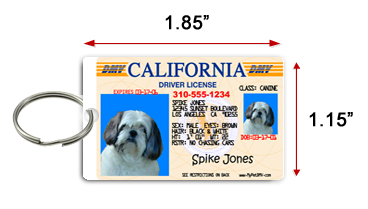 Actual size and dimensions of the Pet ID Card are shown below: Also included with each order are (3) Mini Key Chain IDs to place on your Pet’s collar or your keys. Each is printed directly on hard plastic, water resistant, and perfect for durability. Our Pet IDs and Dog Collar tags can be put on your keychain, on your Pet’s collar, or keep as a spare Pet ID in your wallet. Design online in under 5 minutes, order prints in 24 hours. All across the nation pets and their owners are rushing to MyPetDMV.com to get their personalized Pet ID License Tag!